Sky Wildcat Chosen for Cherokee Environmental Leadership Program – UNITY, Inc.
Wildcat received her two Bachelor of Arts degrees in Psychology and Geography from Northeastern State University in Tahlequah, Oklahoma, and currently serves as a Graduate Assistant with the Center for Tribal Studies. Her cohort will be sustaining traditional activities, such as cooking traditional foods or making baskets from natural materials, and will meet with Cherokee elders for one on one mentorship. “To begin the program, we took a hike in a rural location in Adair County in Oklahoma, and looked for medicinal plants” Wildcat reflected. “We will be working to clear the trail so that elders may visit the area and gather plants they need.” Wildcat exemplifies UNITY Wellness Warrior’s recent “Call to Action” to explore food sovereignty and plan a wellness community service project. 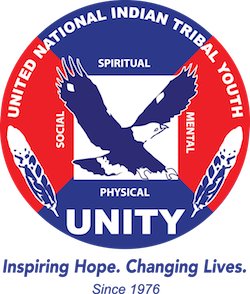 UNITY youth are challenged to seek out elders and community leaders to learn more about traditional foods. Through a partnership with the W.K. Kellogg Foundation, UNITY Wellness Warriors offers a free mobile app for youth to share their traditional food recipes and medicines with other Youth Councils.The mobile app is available for download on Android and Apple devices.